At the end of two days of creative and intense brainstorming, the first prize of US$2,000 was won by team DARe (Digital Agri Rural e-Marketing) for their innovative model to link farmers to markets. They will have the opportunity to get business and sector specific mentorship services from the startup incubator T-Hub, promoted by Government of Telangana, to develop their idea into a viable business or product. The first runner-up was ‘AgNi - Artificial Intelligence System for next generation Agriculture’ and in the second runner-up place was ‘iFarm -Transforming lives, one farmer and one farm at a time’. 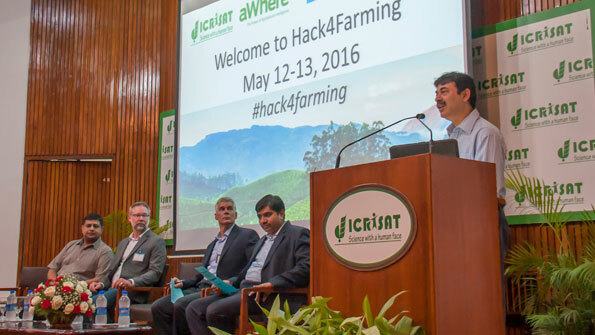 “We are delighted to support ICRISAT in the Hack4Farming initiative, which aims to unlock the benefit of intelligent cloud solutions to positively impact the agriculture sector. The hackathon has highlighted that technology when harnessed correctly, has the potential to transform lives and have a major socio-economic impact,” said Mr Anil Bhansali, Managing Director, Microsoft India R&D Pvt Ltd.
“Hack4Farming was an exciting event and part of ICRISAT’s digital agriculture initiative. Digital technology can accelerate the pace of developing and delivering sustainable and equitable solutions to smallholder farmers and in so doing enable us to achieve the Sustainable Development Goals before 2030. This includes narrowing the knowledge gap between researchers and farmers; providing timely and targeted information to farmers to manage weather and market variability and integrating farmers into profitable markets. Digital technology such as cloud computing and mobile phones provide an important platform for youth to see agriculture as a viable business. These tools will also help us manage natural resources and support a modern food system that delivers safe and nutritious food to all consumers,” said Dr David Bergvinson, Director General, ICRISAT. “There is a lot of potential to develop new digital technologies in Hyderabad, which is seen right here at the Hack4Farming. We want to encourage new projects and ideas by these developers and other stakeholders to improve the lives of farmers and increase the agricultural potential of India,” said Mr Rama Iyer, Senior Vice President and Head Strategic Alliances & Innovation, T-Hub, Hyderabad. “We believe that better information can have an enormous impact on food production to help solve the challenge of feeding a growing global population. In order to realize this, innovative, scalable, and sustainable solutions are required. Hack4Farming is global in scope and we will continue to expand these events to new regions, working with local partners, to help seed innovative solutions that improve lives worldwide,” said Mr Stewart Collis, Chief Technical Officer, aWhere. 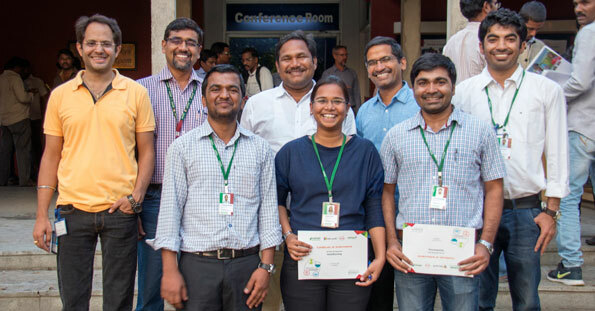 Hack4Farming was held during 12-13 May, at ICRISAT-India with 11 teams participating, each comprising of about eight members. 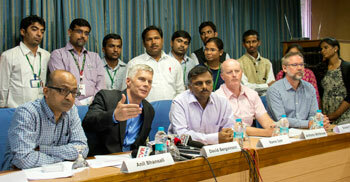 The two-day event was organized by ICRISAT in association with Microsoft, T-Hub incubator and aWhere. A cloud-based application will connect large number of smallholder farmers with multiple buyers, transporters, warehouses, processors and other interested players. A built-in algorithm will help estimate the recommended price on any particular day. The application will also provide location specific weather forecasts to help farmers take climate informed decisions on marketing and production to minimize risk. The platform will provide information on agriculture technology providers in a radius of 40-50 km. It will help minimize the role of intermediaries and reduce transaction costs for farmers. It will help in real-time price discovery using the current e-mandi prices, recent price trends, variety and other quality parameters. In addition, the wealth of data generated on a daily basis on agriculture marketing could be used for analysis by researchers, industry and policy makers. Technology providers, policy makers, donors, practitioners, private sector and civil society came together to discuss how information and communication technologies (ICTs) will enable us to achieve the UN Sustainable Development Goals (SDGs) by 2030. 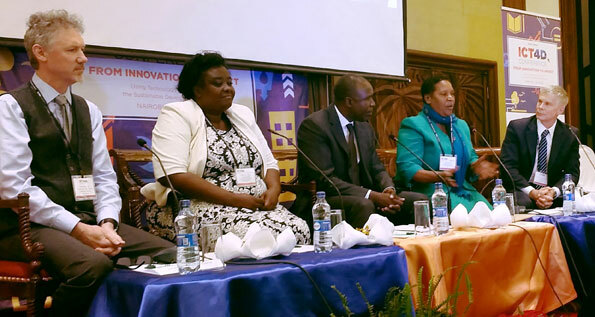 At the ICT4D2016 conference, a panel discussion “The Sustainable Development Goals: Not just Pie in the Sky: ICT is Key” focused on new opportunities for public private partnerships to realize the SDGs. The panel was optimistic about achieving the SDGs but also recognized the need for coordinated and strategic contributions of different sectors to support social, economic and environmental development. Dr David Bergvinson, Director General, ICRISAT, hosted another panel to explore ‘Partnerships to Realize a Digital Revolution in Agriculture in Service of Realizing the SDGs before 2030’. Panelists highlighted the importance of agriculture for the Kenyan economy and the huge potential of ICT for this sector. Kenya’s track record in rolling out ICT solutions for smallholder farmers such as mPesa that links farmers to finance was highlighted. iCow was another example to support farmers to increase dairy production and profitability. A panelist shared that in Ketui, youth are excited to apply ICT to make agriculture a commercially attractive enterprise. There has been an evolution from development agencies pushing technologies to farmers, to farmers demanding technologies with better access to information even in remote regions. Dr Bergvinson emphasized that technologies need to be relevant and be affordable to enjoy high rates of adoption. Business models need to be better understood to ensure that the solutions are sustainable and scalable. The conference highlighted the critical need to rethink Monitoring, Learning and Evaluation (MLE) systems to support development outcomes. Technology providers, practitioners and donors shared best practices to capture, analyze, visualize data to inform decisions to support agile programs that respond to the needs of society. These inputs will be used to drive and design ICRISAT’s new MLE framework to support the implementation of country strategies through strong interactive programs. ICT solutions that are having significant impact in development, including the launch of the SDG ICT Playbook. Government ICT strategies, their implementation, and challenges and experiences to date. The intersection between government ICT strategies and the goals and strategies of private sector businesses and civil society organizations operating in the same geographies. The structure of cross-sector partnerships and business models for ICT solution delivery. Insights from the conference can be reviewed on Twitter (#ICT4D2016). 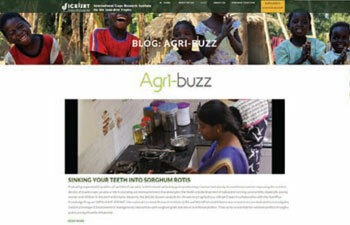 Agri-buzz, a blog that aims to generate healthy discussions around the science that we do. Found something useful in your work or have lessons learned to report or best practices to share? Care to bounce off ideas on the latest in your field, have conversations around your science or share your experiences? Pour out your thoughts to provoke a healthy pow wow or even a hearty laugh! Shortfall in pulse production in India can be overcome by tapping into nearly 6-7 million ha of rice fallows in eastern India. For this to happen, the risk averse smallholder farmers in this region need policy and technology support. Exposure to rural entrepreneurship and encouraging farmer producer organizations will help in the long run. Use of computer based simulation tools for systems analysis, helps target efforts and devise tactics for coping with climate risk, in the highly variable climates of the semi-arid regions- was the key message that emerged from an international workshop on systems analysis. The workshop included hands-on training on System Dynamics (SD) tools using the iThink software to illustrate SD concepts in a modeling context. Dr Quang Bao Le, representing the CRP for Dryland Systems, said that the timing was perfect for bringing increased focus on understanding the potential of value chain modelling, to bring about market led innovation. The concept of an innovations systems approach to the challenge of improving farm productivity, recognizes the importance of conditions that are needed to create demand for technologies and how knowledge may be used to bring about such changes. An important component of innovation systems thinking is that innovations most often emerge when actors collaborate and communicate. “The key to facilitating such dialogue with farmers, service providers, extension agencies and policy makers, is the use of systems analysis using computer based simulation tools,” said Dr Anthony Whitbread, Program Director, Innovation Systems for the Drylands, ICRISAT. In the context of smallholder resource poor agriculture, widely used examples of computer based simulation tools include climate-based crop risk management tools (e.g. crop-soil farming system models APSIM, DSSAT etc. ), household bio-economic models approaches (e.g. optimization, cash-flow budgeting), coupled farm-region-national bio-economic models (e.g. value chain model), whole farm dynamic models (e.g. NUANCES, APSFARM) to mention a few. The first day of the workshop covered state-of-the-art in systems analysis, while the next two days focused on value chain modelling using the software ‘iThink’. Participants were introduced to a toolbox containing relevant analytical methodologies for undertaking R4D in smallholder settings. Participants built their own value chain models drawing on examples from their on-going work: the role of small ruminants and fodder in dry areas of Zimbabwe; medicinal plants as cash crops in Rajasthan; high-quality sorghum in Nigeria, etc. Participants identified key strategies to increase prices received by farmers or create new demand for products and discussed how innovation platforms might be applied to overcome constraints. Resource persons included: Dr Neil Macleod, Dr Ben Henderson and Dr Kanar Diyzee, Commonwealth Scientific and Industrial Research Organization (CSIRO), Australia; Dr Quang Bao Le, CRP on Dryland Systems, ICARDA, Jordan; Dr Whitbread, Dr Vincent Vadez and Dr Peter Carberry, ICRISAT-India. The workshop “Modern approaches in systems analysis of resource poor farming systems with a focus on value chains for market-led innovations” was held during 9-11 May at ICRISAT-India. About 25-30 scientists/researchers from South Asia and sub-Saharan Africa participated. Pulse farmers across Telangana and Karnataka are being exposed to new technologies, varieties, hybrids and innovations in agronomic practices, for improving productivity and thus contributing to the Indian national program of attaining self-sufficiency in pulses. During a recent project review meeting, partners discussed challenges in the seed supply chain, technology uptake by farmers, scale-up challenges, need for developing standardized protocols for agronomic practices, need for mechanization and other issues faced on field and shared work plans for the coming year. As part of out-scaling efforts 1,162 farmers (607 pigeonpea and 555 chickpea) from 28 new villages were involved in the third year. In spite of severe drought, partners could procure 165.8 tons of pigeonpea and 18.3 tons of chickpea certified seeds, for the fourth year. Foliar application of soluble fertilizer and management of Maruca, improved agronomic practices such as sowing methods (dibbling, transplanting), plant to plant spacing and nipping, use of micronutrients, pre- and post-emergence herbicides, integrated pest management (IPM) vs chemical (farmers’ practice) resulted in 15-20% yield increase in various locations. Need based application of chemicals at various demonstrations brought about 50% reduction in pesticide use against the traditional practice. Improved affordable storage at village level, was adopted by 500 farmers. 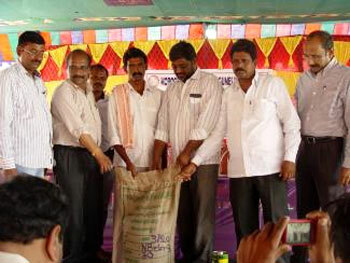 Identify 150 new farmers in each crop and region (600 new farmers) from six villages in Telangana and Karnataka each. Conduct demonstrations in new villages on best-bet practices such as dibbling, trimming, trap crops, IPM and post-harvest of pigeonpea and chickpea and include improved varieties. Conduct six farmer participatory varietal trials on pigeonpea and chickpea, one at each location under Krishi Vigyan Kendras (KVKs) and Regional Agriculture Research Stations (RARS). Organize ecofriendly pest management options such as seed treatment, monitoring key pests through pheromones and use of biopesticides and need based application of chemicals at all target sites. Conduct meetings in the villages and disseminate soil health results and create awareness about improving soil health to enhance production. Critical gaps in seed availability are being addressed by setting up village based seed enterprises. A seed enterprise in Ramapuram village, Mahabubnagar, Telangana, registered as the ‘Ramapuram Farmers’ Cooperative Society’, procured 12 tons of chickpea (varieties JG11 and NBeG 3) and 200 kg of pigeonpea (ICPH 2740) and sold them to farmers making a net profit of ₹125,000 (US$2,080). In the second year, the society took up seed production of chickpea and pigeonpea and procured 21 tons of chickpea and 2 tons of pigeonpea seed of improved varieties and stored them in the village. In Karnataka a formal seed unit was established by University Agricultural Sciences (UAS), Raichur and linkages were established between the project activities supporting seed production of pigeonpea and chickpea, with the seed unit. They were able to procure 5 tons of pigeonpea and 10 tons of chickpea seed. Speaking on the importance of partnerships, Dr Suhas Wani, Research Project Director, Asia Research Program, ICRISAT, in his opening remarks said, “Our partners enable us to have direct access to the farmers. Partners have a wealth of information on, what are the farmers’ demands, what are their constraints and what are the challenges they face in implementing recommendations, so that our research can be tailored to fit their needs.” Dr SA Patil, Advisor to the project, appreciated the progress made and the contribution by ICRISAT. The project review and planning meeting, held on 11 May, was attended by all project partners. Partners: Department of Agriculture, Telangana; Department of Agriculture, Karnataka; Professor Jayashankar Telangana State Agricultural University, RARS Palem; University of Agricultural Sciences (UAS) Raichur; KVK Raichur; KVK, Gulbarga; KVK Raddewadghe; KVK Bidar; and ICRISAT. Creating awareness about aflatoxin, its prevention and detection is a priority target in the groundnut and sorghum value chain programme of the Federal Government of Nigeria. In a step towards strengthening this, ICRISAT helped set up two aflatoxin detection and quantification laboratories at the NARS centers in Nigeria. 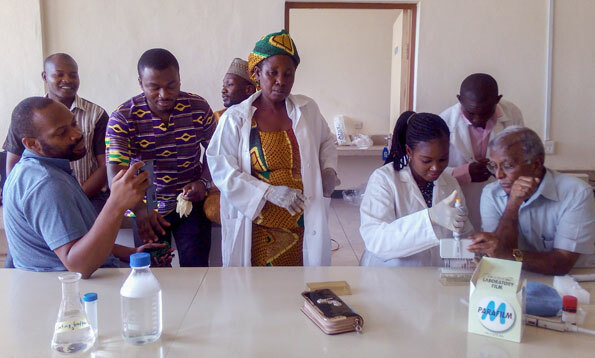 The two laboratories set up at the Institute for Agricultural Research (IAR)/Ahmadu Bello University (ABU) Zaria, and the Federal University of Agriculture (FUAM), Makurdi, are expected to serve as aflatoxin detection centers in groundnut, sorghum and other grains and food products susceptible to aflatoxin contamination. It will assist in aflatoxin related research and learning by students, academic staff and other researchers, while ensuring that the food is safer for consumption and export. Aflatoxin contamination of agricultural products has assumed global significance and the whole of Africa is highly susceptible to aflatoxin contamination. Aflatoxin contamination of major crops such as groundnuts, sorghum and maize occurs above acceptable levels specified by Europe (4 ppb) and USA (20 ppb) and has significant negative effect on human and animal health, as well as the accompanying economic impact since such products cannot exported. However, even low levels of exposure to aflatoxin can result in measurable human health impacts. During 18-21 April, laboratory equipment was received at IAR/ABU Zaria and staff from both IAR/ABU and FUAM were trained. The equipment was received by Prof DA Aba, Assistant Director, Research, who expressed his pleasure at ICRISAT’s interventions. On 22 April the laboratory equipment was installed at FUAM by the staff who attended the training at IAR Zaria, with the support of ICRISAT Nigeria. A total of 19 participants attended the training at IAR Zaria: 4 from FUAM, 12 from IAR/ABU Zaria, 1 from IAR-Kano, 1 from ICRISAT-Nigeria and 2 from FMARD groundnut and sorghum value chains. The installations and training were conducted by Dr Hari Sudini, Senior Scientist, Groundnut Pathology, ICRISAT-India and Mr Veera Reddy, Senior Scientific Officer, ICRISAT-India. A recent review and planning meeting showed that partners were on track towards achieving the project goals and delivery of nutritious and high yielding sorghum and pearl millet hybrids to the smallholder farmers in western Africa. The overall goal of the project is to enhance sorghum and pearl millet productivity in West and Central Africa through cultivation of nutritious hybrids, contributing to food security, income generation, and improved nutrition. To achieve this goal, scientists are collaborating to define functional heterotic parental pools required for sustainable hybrid development, establish efficient hybrid breeding strategies based on quantitative genetic parameters and develop molecular breeding tools, and create new and diverse hybrid parents. The sorghum team is targeting the main sorghum production systems (700-1100 mm rainfall) with work on Guinea grain types in Mali and on Kaura and Fara Fara grain types in Nigeria. The pearl millet research focus is on the 400-700 rainfall zone with sandy soils and variable rainfall, targeting long-panicle hybrids for both Niger and Senegal. The review showed that project milestones were all achieved and the close collaboration of the Malian and Nigerian sorghum team was working well and looked promising. For pearl millet there were some major drawbacks, and plans to handle it in the coming season were discussed. The meeting, hosted by ICRISAT-Niger was held during 23-25 April and attended by all project partners and ICRISAT pearl millet and sorghum breeding team from Mali, Niger and Nigeria. Foliar fungal disease screening nursery at ICRISAT-India with infector rows and test entries. 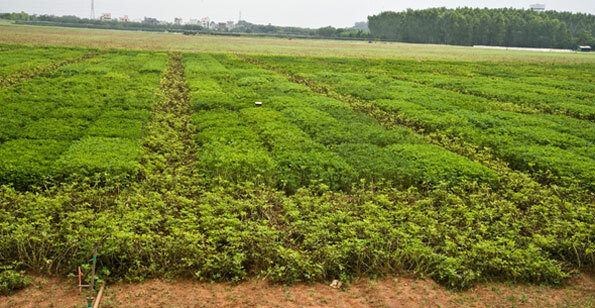 For the first time in groundnut crop, a Near-Isogenic Lines (NILs) evaluation trial of marker assisted backcrossing (MABC) derived lines, was constituted for national testing, under the All India Coordinated Research Project on Groundnut (AICRP-G). Constituting NIL trial under AICRP-G, is a key step towards the release of NILs for cultivation in target ecologies. AICRP-G coordinates the release of groundnut varieties in India through multi-location testing of groundnut lines across five groundnut growing agroecological zones of India. Thirteen elite NILs of three mega-varieties in India were recommended for evaluation. Three mega-varieties of groundnut in India, TAG 24, JL 24 and ICGV 91114, were improved for resistance to foliar fungal diseases following marker assisted breeding approach at ICRISAT-India. Early generation (BC2F2 and BC3F2) selection, using markers for major effect QTL, followed by field phenotyping of fixed lines over two seasons, enabled identification of best-performing lines for target trait and pod yield. Subsequently, a multi-location testing at seven locations across six major groundnut growing states (Andhra Pradesh, Telangana, Gujarat, Karnataka, Maharashtra and Tamil Nadu) of India was conducted with elite lines to identify location specific high pod yielding introgression lines. Thirteen promising NILs were recommended for evaluation, under a special trial. The recommended NILs were not only superior to their respective recurrent parent but also recorded a 7-75% higher pod yield over best Zonal check. NIL trail was constituted at the recently held workshop during 18-20 April at Junagadh Agricultural University, Gujarat. Project: Multi-location Evaluation of MABC Derived Disease Resistant Groundnut Lines. The recently held training workshop on the use of modern genomic tools for breeding research and applied breeding, addressed two aspects: the use of Genotyping-by-Sequencing (GBS) in research projects and the use of converting single nucleotide polymorphisms (SNPs) into single marker assays and how they could be used in applied breeding. The GBS training was given by Dr Jason Wallace, Assistant Professor, University of Georgia, USA, while the single marker training was given by Dr Willmar Leiser, University of Hohenheim, Germany. Both trainings complemented each other and showed the whole process of data creation and final use in breeding. In the GBS workshop, Dr Wallace showed participants how GBS works, its use in ongoing projects and parameters that need to be considered when choosing GBS as genotyping method. He further gave an applied session on how to use GBS data in the software TASSEL 5, how to conduct basic population genetics and genome wide association mapping. At the end of the GBS workshop, the participants conducted a Genome Wide Association Study (GWAS) and found significant SNPs in a sample data set. The second part of the workshop by Dr Leiser included training on how to finally find the identified SNPs in the respective genome, retrieve sequences, convert the target SNPs into Kompetitive allele-specific PCR (KASP) markers and finally use these markers in breeding programs. Dr Leiser explained the several different marker systems for SNP detection and went into the process of data retrieval from reference genomes using TASSEL 5 and other software. This step was directly related to the session by Dr Wallace. Finally, the participants learned how to submit genotyping projects to LGC Genomics through the Integrated Breeding Platform and how to handle the whole process from plant tissue sampling and sending all documents to LGC Genomics. 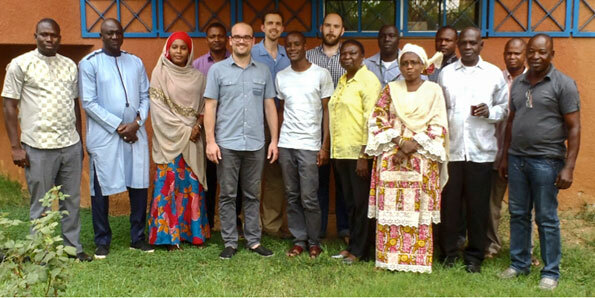 The trainings will help the breeding community in western Africa to use modern molecular marker technologies in their research projects and in their daily breeding programs. ICRISAT-Niger hosted the training workshop during 21-22 April which had 21 participants from different NARS partners, ICRISAT-Mali and ICRISAT-Nigeria, as well as young researchers from the West Africa Centre for Crop Improvement (WACCI), Ghana. As part of the 7th FARA Africa Agriculture Science Week, IITA is facilitating a Thematic Session on “Sustainable Productivity Growth” on 14 June 2016. The session will approach sustainable productivity growth from a systems perspective. Contributions are invited that seek to understand the complex interrelations between biophysical, technological, socio-cultural, economic, institutional and political problem dimensions of productivity growth across farm, village, district, regional and national levels, and how these are shaped by and beneficial for different stakeholder, gender and age groups. Successful scaling of sustainable productivity growth innovations (integrated socio- technical systems). Length of abstracts: 600 words (max). Authors should indicate under which theme they are submitting their abstract. Submissions of abstracts: Use the Abstract Template for your submission, and send your abstracts to Dr. Marc Schut at m.schut@cgiar.org before 5:00 pm on 27 May 2016. You will be informed on our decision before 4 June 2016.